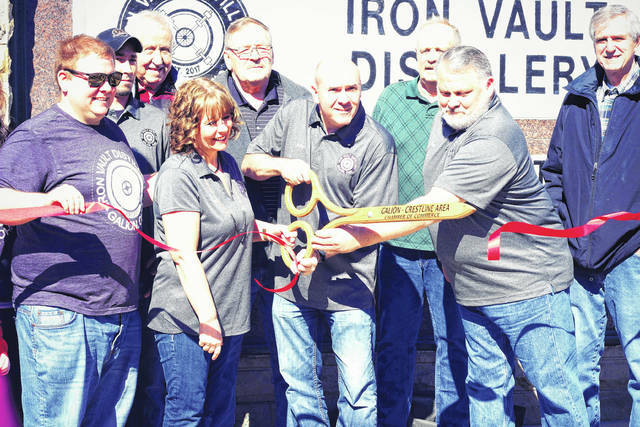 GALION — The Iron Vault Distillery opened its doors to the public Saturday afternoon in uptown Galion. The new business had a well attended ribbon cutting at 2 p.m. followed by tours of the building and product tasting. The distillery has been both a labor of love and learning experience for owners John and Lori Bassett and Sam Thacker. The idea started as they had originally looked into making beer, but decided the market in the area was too flooded with breweries. Bassett had recently purchased an antique still, which was the inspiration that led the duo towards the idea of a distillery instead. The idea to locate their business in Galion came about because Sam Thacker is a Galion graduate who still had ties to the area. Both the Bassetts and Thacker currently reside in Ontario. The Iron Vault Distillery is not bar. It is set up to offer tours of the distillery area along with samples and bottles of their products for purchase. Currently, customers are able to purchase Iron Vault Vodka and Moonshine but the Bassetts and Thacker have other plans on the horizon. Another important part of the business for the owners is to use as much local product in their process as possible. They purchase their grains from Marysville, and will buy local fruits when they make the move towards flavored liquors. Current hours of operation for Iron Vault Distillery are on weekends only. Both Thacker and Bassett are still working their “day jobs” as part of a technology consulting company in Mansfield. However, their liquors are available at Eighteen-O-Three Taproom as well as Ralphie’s in Galion.